Earlier this month Mayor Michael Hancock cut the ribbon on the Arapahoe Street protected bike lane and promised three more next year. What Hancock didn’t mention was that his Department of Public Works is already handing out special privileges to allow some people to park in the bike lane. He didn’t mention that one section of the bike lane is no longer protected, either. 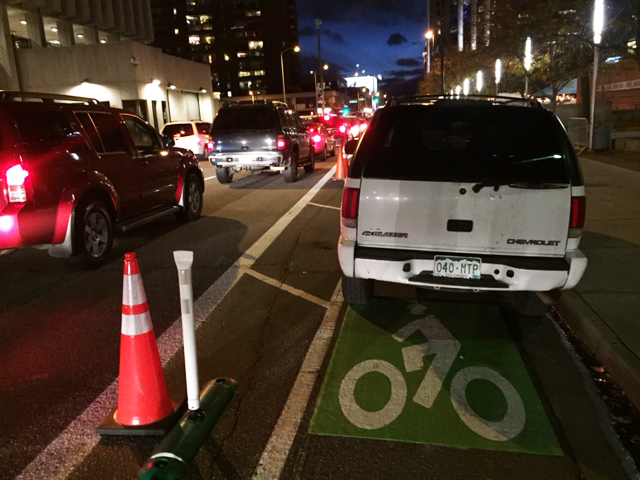 The agency permitted Christkindl Market, a month-long holiday event at 16th and Arapahoe, to use the “first travel lane” — in this case the bike lane — for setting up and tearing down the market on November 12 and December 28 and 29. The above photo was taken on November 18. The car had a city-issued permit displayed on its dashboard, but according to that permit, it was parked illegally. “There are great demands right now for use of the public right of way (walking, biking, driving, parking, transit, loading/unloading, construction, events, etc. ), and we must balance its use among a variety of stakeholders,” DPW spokesperson Nancy Kuhn said in a statement. In another instance of “balance,” the bike lane on the 2200 block of Arapahoe Street is no longer protected by a lane of parked cars or plastic posts. “The changes were made based on discussions with property owners/businesses on the block,” Kuhn stated. “Balancing” streets is often code for stripping out features that improve walking, biking, or transit in order to avoid upsetting people who want to preserve the status quo for driving and parking. If Hancock and DPW were serious about balance, they would immediately overhaul most streets in the city to put transit and active transportation on equal footing with cars. Instead, driving and parking continue to consume the vast majority of the city’s street space. A few property owners didn’t want a protected bike lane in the street ,which they don’t own. Makes perfect sense then to remove it at the cost of providing safe, convenient bike routes for all citizens. I don’t think this car was parked illegally since DPW had closed off the lane for the purpose of parking. As DPW correctly states, it’s their job to balance conflicting priorities. ANY time you grant “exclusive” use to any one user or group of users, ALL other users are going to be negatively impacted. IF the bike lanes were the most-heavily-used lane on Arapahoe, DPW would not have picked it for a different, temporary, use. Bottom line – words are cheap – use it or lose it . . . There is no more “exclusive use” of city property with the protected lanes as there was before the changes were put in place. There was no decrease in the number of travel lanes and no loss of parking. The only changes were that the travel lanes were slightly reduced in width in order to add space for the protection. That was a good thing since narrower lanes slows traffic and increases the safety for everyone on the street. Those property owners pushed for that “rebalancing” of that block of Arapahoe for reasons that solely benefit them.